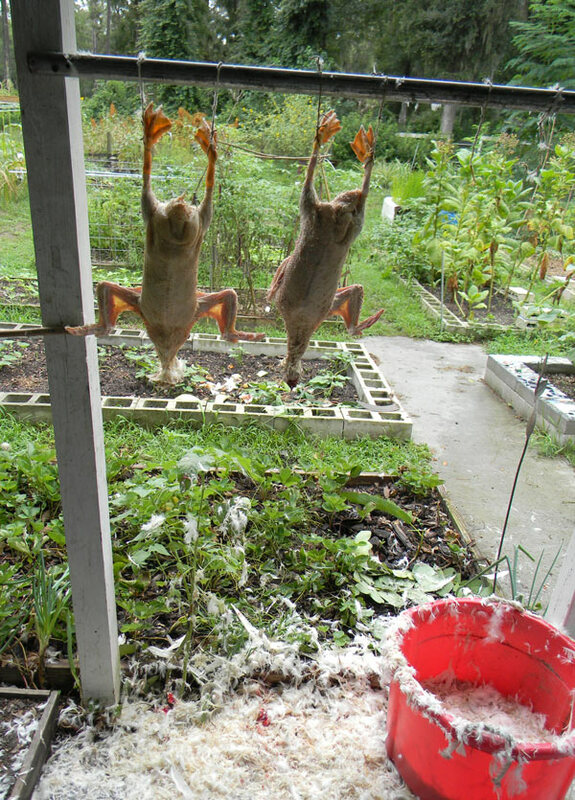 Florida Survival Gardening: Did you ever get really tired of a particular type of animal? Did you ever get really tired of a particular type of animal? Then, next thing you know, you've removed their heads, plucked and gutted them, then put them in your freezer, where they reside until slow-roasted into a series of delicious, gourmet dinners? Side note: ducks are a royal pain to pluck. Omigosh holy mackerel for serious. They're much easier to pluck at certain times ... I think - right after the molt when they don't have new pinfeathers yet (you may want to double check - it's been a while). Also, I think water needs to be hotter than for chickens. Are you guys coming on the 20th? I forgot about the 20th - would you e-mail me details? davidyenergoodman (at) gmail (dot) com. You're right about the pinfeathers - we were late on slaughtering them. Interesting on the water - I'll bet that's true. We had to dunk them multiple times. The water runs right off... like water off a duck's back. Yeah - Herrick Kimball is the bomb. I bought his wheel hoe hardware and built it last month... great little machine. The plucker is a bit more involved, but it's on my long-term list. There's a vid on youtube where a guys uses paffin wax to remove their feathers. I love the opening statement. I feel you on that one. And the amount of food they consume!!! And messy! "Nematodes are little worms that chew up roots, reducing plant vigor and generally messing up your plans for a healthy garden. Seriously... ducks are total pigs. We mixed them up with our chickens... and since they left this sphere for a better place, the poultry waterers are staying full... the feed levers are dropping at a much lower rate... and there are no horrible quacking sounds irritating me every time I walk through the yard.